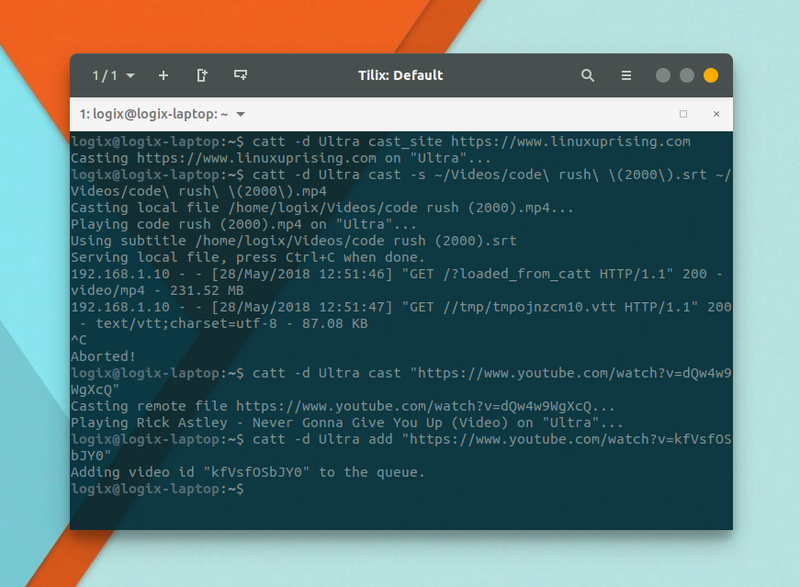 CATT, or Cast All The Things, a command line tool to send videos from many online sources as well as local files to your Chromecast, was updated to version 0.7.0, getting 2 major new features: cast file with local or remote subtitles, and cast a website to Chromecast. Related: Cast Videos To Chromecast On Linux With Gnomecast. The new CATT "cast website" feature is similar to the "Cast tab" Google Chrome feature, so the website casted using CATT is dynamic, and not just a simple static view of the website. This feature is great for quickly sending a website to be viewed on your Chromecast, or for automation (can be used in scripts, e.g. create a custom Chromecast dashboard and automatically send it to the Chromecast when the device is idle). It's not useful if you need to interact with the casted website though, because you can't do that with CATT (it can control casted videos, but not websites). As for the new subtitles feature, CATT automatically converts the subtitles to the WEBVTT format on the fly, so there's no need for prior conversion. The videos still have to be supported directly by Chromecast though, as CATT doesn't do any video transcoding. In the same way you can cast videos from any website supported by youtube-dl, which CATT uses internally. catt -d Ultra cast "https://www.youtube.com/watch?v=dQw4w9WgXcQ"
Where Ultra is the name of the Chromecast device on which you want to stream the video and the YouTube url is the video you want to play on your Chromecast. You can also use the CATT configuration file to select the default device. See how to do this here. Replacing subtitle.srt with your subtitle file and video.mp4 with the video you want to cast. CATT converts the subtitles to WEBVTT on the fly, but it does not convert videos, so make sure you only cast videos supported directly by the Chromecast device or they won't work. Replacing the Linux Uprising URL with the URL of the website you want to cast to your Chromecast. cast_site     Cast any webpage to a Chromecast. 1. Add ~/.local/bin to your PATH (if it's not already added). Also export the PYTHONPATH as /usr/lib/python3/dist-packages:$PYTHONPATH to avoid having other apps picking up Python modules from ~/.local/lib. If you get a permission error when trying to install CATT using this command, you may have previously used PIP to install packages as root. This is not recommended but in such a case, you can force the CATT installation by running the install command above with sudo. To download the CATT source, see this page.